Fall is coming, which means our outdoor entertaining will likely be around a fire pit. But there’s more to enjoying your outdoor space in the crisp weather then stoking the flames. 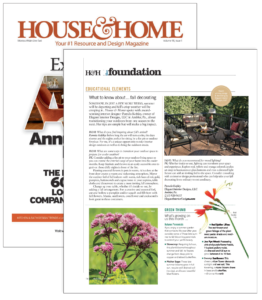 I had the privilege of being interviewed in the July issue of House & Home Magazine about fall decorating…both inside and out. It’s a great time of year that’s associated with harvest and Halloween, and your choice of colors, flowers and accessories will probably reflect that. 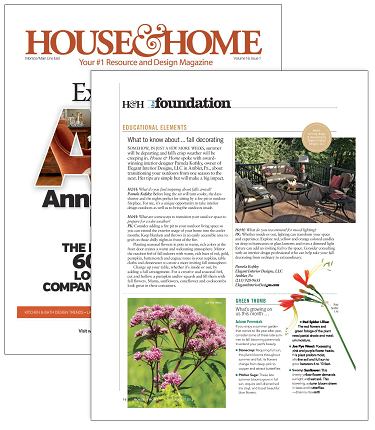 I offered the editors of House & Home some general tips, which you can read by double clicking the article. While I provided ideas that could fit in a six-paragraph article, there are many, many opportunities to turn your indoor or outdoor living space into a relaxing, aesthetically pleasing retreat to host friends, sip coffee, enjoy a hot tub or dive into a book. Everyone’s space, tastes, and sensibilities are different. Some things are simple, others a bit more involved. Fortunately, Elegant Interior Designs is expert at assessing a space, talking with a client, and keeping an eye on the budget in order to create, not the perfect space, but the perfect space for you. I’m very excited to be featured in House & Home. But I’m even more excited to have the chance to work with you as the days begin to get shorter and the temperatures get cooler.